An entire South Lanarkshire community has been turned into a nativity scene. 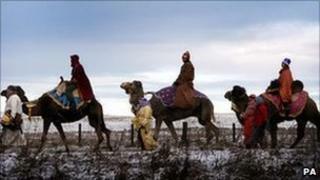 The United Parish of Carstairs and Carstairs Junction recruited three camels and a donkey for a parade to mark their festive celebrations. Street signs were changed to reflect the nativity theme while every home along the parade route displayed a sign saying "no room". Carstairs Junction was transformed into "Nazareth", while the village became "Bethlehem". The camels were accompanied through the streets by three wise men, along with Mary and Joseph. The Reverend Alan Gibson, from the United Parish of Carstairs and Carstairs Junction, said the event was designed to share the Christmas message with people in the local community who would not normally come to church. He said: "Rather than waiting for people daring to cross the threshold of the church door, we thought we had to take the Christmas message outside. "The parade has been designed to represent the nativity story in an engaging and thought-provoking way."